Upon the foregoing papers it is ORDERED and ADJUDGED that the motion by the Newburgh respondents is denied and the petition is granted; the determination is annulled and the matter is remitted to the Newburgh respondents for further proceedings, without costs or disbursements. Page 1 of 6 Petitioners own property In a city block In the City of Newburgh which is bounded by Lander Street, Johnston Street, 1sc Street and Broadway. Respondent City of Newburgh (hereinafter “the CityU) owns property in the same block. This proceeding concerns a plan to develop the City’s property, creating a supermarket (or other retail space) and residential units (“the Mid-Broadway Project”) . The City’s property is in a TC-l Zone (Tourist Commercial) A supermarket was not a permitted use in a TC-l zone. Only “touristu related retail uses were permitted in the TC-l Zone (Schedule of Use and Bulk Regulations, city of Newburgh Zoning Ordinance, Chapter 300 of the Code of the City of Newburgh) . On October 23, 2012, the City entered into a Development Agreement with respondent Mill Street Partners, LLC (hereinafter “Mill Street”) . The City designated respondent Mill Street as the developer for the Mid-Broadway Project and stated: The Development shall consist of a mixed-use project consisting of housing and commercial components along Broadway, Johnston Street, and Lander Street in the City of Newburgh, New York. The Development may be constructed in one phase (consisting of approximately 103 residential rental apartment units, together with a ground floor supermarket and/or other retail space and sufficient parking spaces) or may be constructed as a two-phase project [with the phase I Project consisting of approximately sixty-seven (67) residential rental apartment units, together with a ground floor supermarket and/or other retail space and sufficient parking spaces and the Phase 2 Project consisting of the new construction of approximately thirteen (13) two-family attached residential townhomes, together with sufficient parking spaces). In either case, total residential development shall not exceed 105 residential units and the Development shall provide, at a minimum, at least one parking space per residential unit. (Development Agreement, Article I, section 1.02) page 2 of 6 The City agreed to adopt “modifications to the City’s Zoning Ordinance to permit the proposed Development” [Id., Article V, section 5.03 (B) (I) J . On May 28, 2013, the City Council enacted Ordinance 6 of 2013, entitled “An Ordinance to Amend Article VII, Entitled ‘Special Use Permits’ of Chapter 300 of the Code of Ordinances of the City of Newburgh entitled ‘Zoning’ by Adding Section 300-38 Entitled ‘LargeScale Mixed-Use Development Special Permit’ ” (Exhibi t G to the Petition) . It incorporated the provisions of section 300-35 of the Zoning Ordinance. Section 300-35, which governs special uses provides that a condition to be fulfilled is that “[tJ he use requested lS listed among the special uses in the zone for which application is made”. On November 12, 2013 the City Council granted Mill Street’s application for a special use permit to conduct a mixed-use building consisting of 13,000 square feet of retail space on the ground floor and 91 residential units on the upper floors. The only condition imposed upon the special use permit was that it had a duration of one year. Petitioners bring this Article 78 proceeding seeking review of the City Council’s determination to grant the special use permit. Petitioners allege, inter alia, that the uses which comprise the “mixed-use” are not permitted uses in the TC-1 zone. They also claim that proper notice of the public hearing was not given to the persons entitIed thereto and that the permit allows parking arrangements Page 3 of 6 which violate the City of Newburgh Zoning Ordinance. The Newburgh respondents now move to dismiss the petition purporting to state objections in point of law [CPLR 7804(f)J. A motion pursuant to CPLR 7804(f) is analogous to a pre-answer motion pursuant to CPLR 3211 in an action. For the most part the “objections” contemplated are those which do not go to the merits and might possibly allow the court to dispose of the proceeding without reaching the merits at all (see generally Siegel, New York Practice [5th Ed] § 567) . The only such objection raised is to petitioners’ standing and, perhaps, a failure to join necessary parties. As above stated, petitioners own property in the same city block as the property for which the permit was issued and the petition alleges that the parking approved is within 20 feet of their property in violation of the Zoning Ordinance. Petitioners clearly have standing; their property is in close proximity to the subject property and they have also alleged an injury in fact which is within the zone of interests protected by the Zoning Ordinance (see Matter of Gernatt Asphalt Prods. v Town of Sardinia, 87 NY2d 668; Matter of Sun-Brite Car Wash v Board of Zoning & Appeals of Town of N. Hempstead, 69 NY2d 406) . The court does not find that other neighboring landowners are indispensable parties [CPLR 1001J The parties have argued the merits at length. The court does not see a need to allow the service of an answer and allow the Newburgh respondents two bites at the apple (see Siegel, supra; Page 4 of 6 Rockland County Patrolmen’s Benevolent Association, Inc. v Collins, 225 AD2d 534; Breidis v Village of Tuxedo Park, 156 AD2d 744) . An applicant for a special use permit must establish that the proposed use complies in all other respects with the zoning ordinance (see Matter of Tandem Holding Corp. v Board of Zoning Appeals of Town of Hempstead, 43 NY2d 801; Matter of Vergata v Town Board of the Town of Oyster Bay, 209 AD2d 527; Matter of CBS Realty v Noto, 139 AD2d 645) . Here, the respondent City Council granted the special use permit to allow two uses not permitted in the TC-1 zone, namely a retail space which is not “tourist-related” and residential uses on upper floors of buildings which exceed three stories in height. The court rejects the Newburgh respondents’ argument the in allowing a mixed-use it may allow any conceivable uses to comprise the “mixed use” without regard to the other provisions of the Zoning Ordinance. Accordingly, the determination is annulled and the matter is remitted to the Newburgh respondents for further proceedings. The foregoing constitutes the decision, order and judgment of the court. 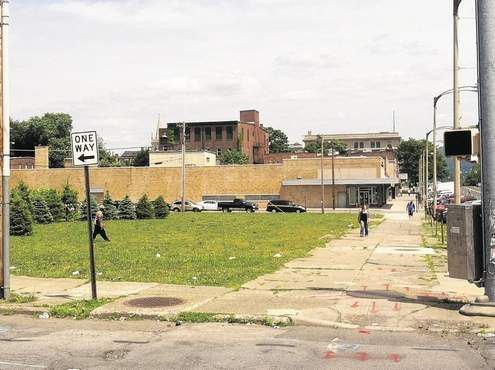 CITY OF NEWBURGH — An Orange County judge has done what public protests could not: halt a proposal to turn a high-profile vacant lot in the City of Newburgh into a housing development with a street-level supermarket. Judge Elaine Slobod recently rejected the city’s motion to dismiss a petition that a group of property owners filed against the City Council and Mill Street Partners LLC. In 2012, the New York City-based firm agreed to build a $26 million complex with 91 housing units on the city-owned lot. Slobod also voided the Nov. 12, 2013 vote by four council members to grant Mill Street a one-year special-use permit for the property, which sits in the “Tourist-Commercial” zone. She ruled that the city voted to allow two uses not permitted in a TC-1 zone: a retail space that is not “tourist related” and residences on upper floors of a building exceeding three stories in height. Mill Street’s project called for a supermarket, 40 one-bedroom apartments, 39 two-bedroom units and 12 three-bedroom units, four of them duplexes. It is supposed to draw people making between $30,000 and $75,000, and would rent for between $750 for a one-bedroom up to $1,400 for a duplex. Concerns dogged the project, however. Some raised doubts about the project’s ability to attract people making upwards of $75,000 and others doubted a full-service supermarket could survive in that location. Parking also proved an issue. Mill Street proposed using parking spaces behind the county-leased Department of Motor Vehicle office, which sits across Lander Street from the lot. “There simply were not enough parking spots,” Sachs said. Mill Street was to finance the project by combining $18 million in tax credits and public subsidies with $8 million in private money. So far, the firm has not announced any public funding for the project. Mill Street principal Patrick Normoyle did not return a phone message. Newburgh Mayor Judy Kennedy, the lone vote against the special-use permit, said last week she has not heard from Mill Street about its response to the court ruling. “We need to understand what the decision means, and we also, at some point, need to understand what Mill Street wants to do about that,” she said. Note: Mr. Lipman of Fabricant Lipman & Frishberg, was the attorney for the Plaintiffs.